Heat oil in a pan add cardamom,cloves,onion,tomatoes,ginger,garlic saute & grind a fine paste. Heat oil in a pan add cuminseed,paste,red chilli powder & Boil until raw flovour extracts ,add the boiled potatoes. To serve with Rice or Chappathi or Roti. 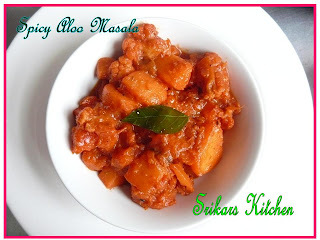 spicy masala aloo looks yummy. I have to look for kashmiri chillie powder here. Mmmm, potatoes always look appetizing! Sabji looks nice and yummy...mouthwatering actually ! Oh, look at the colour of that curry. Spicy hot. Yum!